For more than 60 years, Williams Sonoma has inspired creative cooking, relaxed gathering and comfortable everyday living. Our exclusive assortments include everything from professional-quality kitchen equipment, original tableware and premium specialty foods to fine home furnishings and accessories. 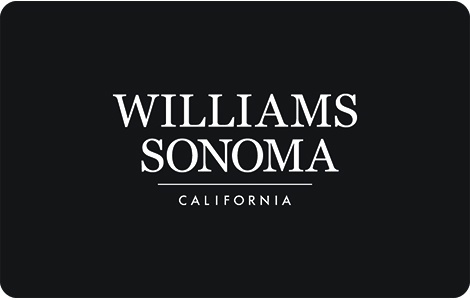 For a store near you or to request a catalog, visit us at williams-sonoma.com or call 1.800.541.2233. This card may be used for making purchases at stores in the United States & Puerto Rico, by phone or online with Williams Sonoma®, Pottery Barn®, Pottery Barn Kids®, PBteen®, Mark and Graham® and west elm®. It may not be redeemed for cash or applied as payment to any account, unless required by law. Williams-Sonoma does not accept responsibility for cards lost, damaged or stolen, or any unauthorized use of cards. Unauthorized resale prohibited. Acceptance of this card constitutes acceptance of these terms and conditions. Williams-Sonoma, Inc. reserves the right to change these terms and conditions at any time. Visit williams-sonoma.com for balance inquiry, store locations, or to place an order. To place an order by phone, call 1-800-541-2233. For balance inquiry by phone, call 1-800-846-9817.